Served with Side du Jour: Maple Sausages, Candied Bacon, Honey Ham Medallions, or Apple Chicken Sausages. Perhaps with a Kiwi Strawberry or Vanilla Mango Fresh Fruit Yogurt Parfait, our Signature Tanglewood Granola, a Hearty Assortment of Baked Breads, Muffins, or Bagels, Jams and Juices, Rich Roasted Coffee and Select Teas. Homemade Cookies, Snacks and Beverages, Seasonal Lemonade or Hot Chocolate are also Available Daily. 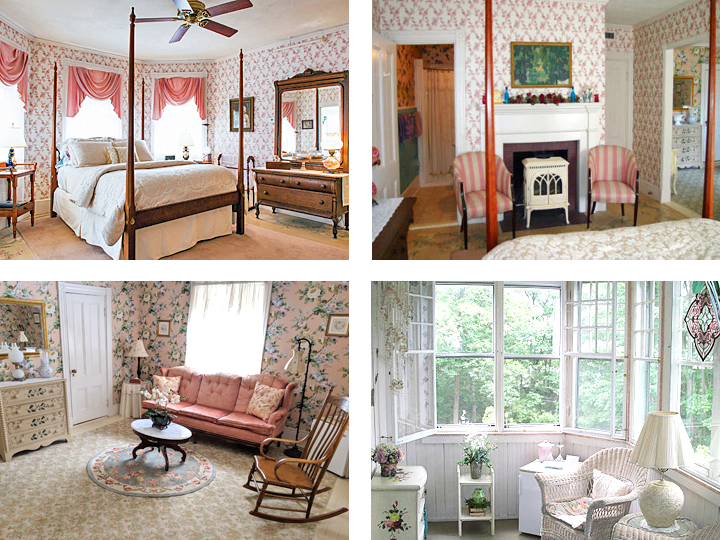 Our breathtakingly romantic and elegant 550 square foot York Harbor Suite is furnished with period antique treasures and floral hand painted floors and walls, with a breezy screened private sunroom porch perched above the garden fountains, a large separate sitting parlor, and a queen-size four-poster pencil with a ceiling fan above. A favorite for honeymoons, anniversaries, or birthdays, the room is decorated in soft shades of mauve, teal, and ecru. The suite has a private bath, refrigerator, and gas log fireplace. Located on a private level of the first floor, this uniquely shaped room features its own private porch sitting area on the veranda overlooking the lawns and garden woodlands, and is luxuriously furnished in rich tones of champagne, olive, and claret. It’s five sunny windows and queen-size sleigh style bed are decorated in striped damask and jacquard exuding old world warmth and charm. The Billiard Room has a gas log fireplace, refrigerator, and private bath. A very special spacious room! Walk through double doors on the mezzanine level of the grand staircase into the essence of yesteryear. Once the library, this room offers a distinctive combination sleeping and sitting area with a refrigerator and gas log fireplace. The five large windows and high ceilings are accented with intriguingly angled striped wallcoverings and fabrics in shades of mocha, burgundy, and teal. 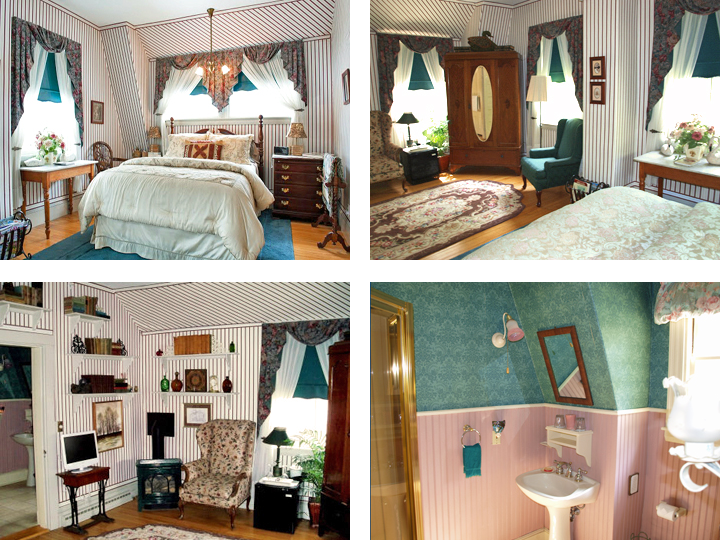 The Library has a queen bed, ceiling fan, and large private bath with glassed-in shower. Featuring two rooms with an irresistible abundance of space! 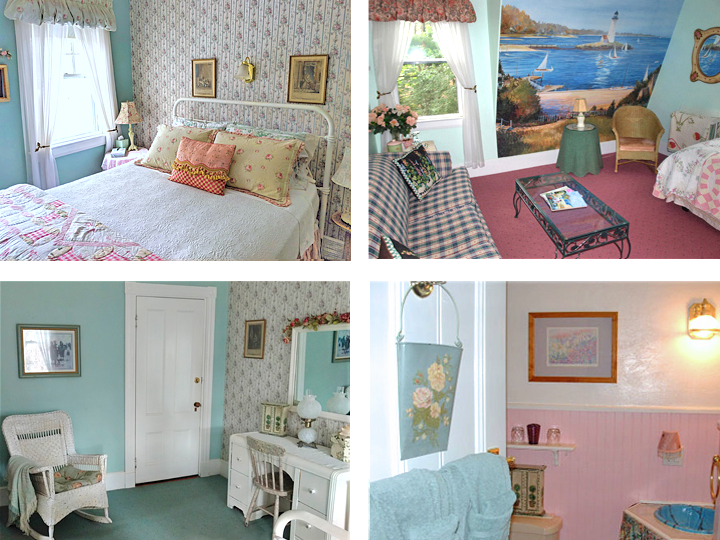 This quintessentially Maine inspired suite serenely situated on the seaward side of the house reflects the ambiance of a seaside cottage with its lighthouse mural, hand painted furniture, wicker, quilts, and Laura Ashley floral fabrics in shades of sea green and tea rose. 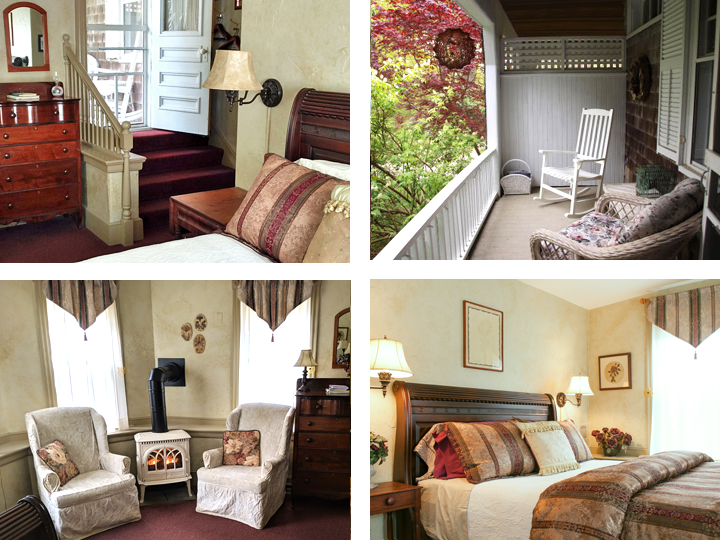 The Cottage Suite has a vintage antique ivory queen bed, Duraflame electric fireplace, and private bath, with an adjoining sitting room that comfortably expands the living space with a sofa, refrigerator, ceiling fan, and twin. Additional fee of $25 for any third person. Reminiscent of turn-of-the-century voyages at sea, this peaceful and restful room is appointed with charcoal and white toile wallcoverings, antique inlaid mahogany furnishings, and an authentic embossed oak and brass seafarer’s chest. 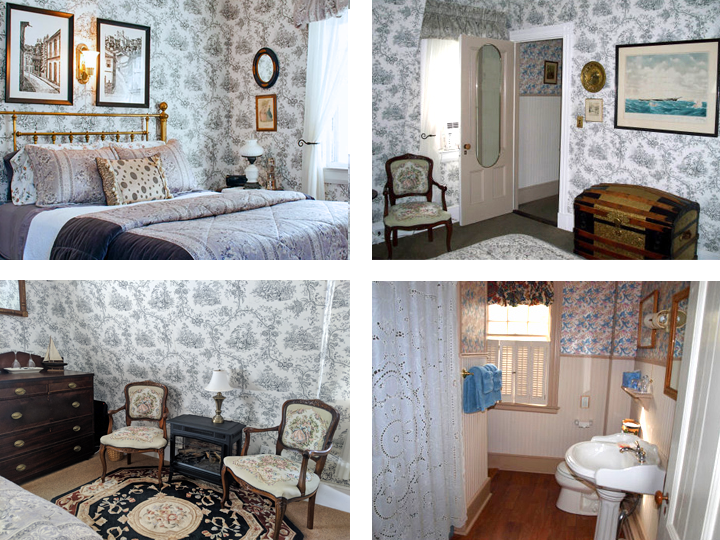 The Captain’s Quarters features a queen size English brass bed with ‘Dancing Lady’ tapestry sidechairs and an extended private bath with two sinks and a combination shower tub and Duraflame electric fireplace. 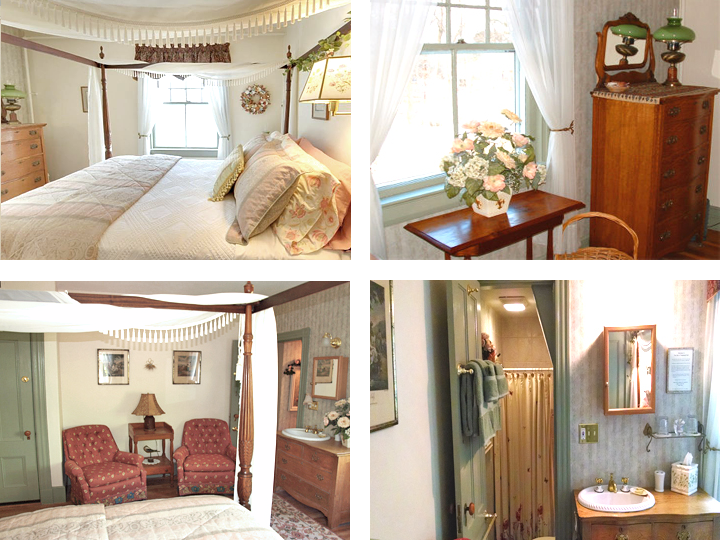 Located on the north side of the house overlooking the perennial gardens, fountains, and lovely woodlands, the Garden Canopy Room is a comforting cozy retreat. Fabrics in shades of rust, peach, and sage accent the soft butter yellow walls. Highlights are the elegantly draped raised high queen-size four-poster rice bed and the step-down ‘secret passageway’ private bath with an antique oak dresser hand-painted sink and Duraflame electric fireplace.